VietPress USA (Oct. 9, 2018): California professor Christine Blasey Ford sent her letter on Judge Kavanaugh's sexual misconduct to California's Democrat Senator Feinstein with request for confidentiality. The letter, in which Ford requested anonymity, leaked to the media, resulting in a contentious delay in Kavanaugh’s confirmation to the high court. At his rally, Trump put the blame for the leak on Feinstein. During a hearing at which Ford and Kavanaugh both testified before the Senate Judiciary Committee, Feinstein addressed the claim that she was responsible for leaking the letter in an effort to torpedo Kavanaugh’s nomination. In a speech last weekend announcing that she would support Kavanaugh’s nomination, Sen. Susan Collins, R-Maine, said she was certain that Feinstein was not the leaker. “She is a person of integrity and I stand by her,” Collins said. “President Trump and Senate Republicans are trying to deflect attention from Brett Kavanaugh’s sexual assault allegations by saying my staff or I leaked the letter from Dr. Christine Blasey Ford — they’re wrong,” Feinstein said. But today on Tuesday at a rally in Council Bluffs, Iowa, President Trump took aim at Sen. Dianne Feinstein, D-Calif., for her handling of a letter sent by Christine Blasey Ford that accused Supreme Court justice Brett Kavanaugh of sexual assault more than three decades ago. The chant was familiar, but its target was new. 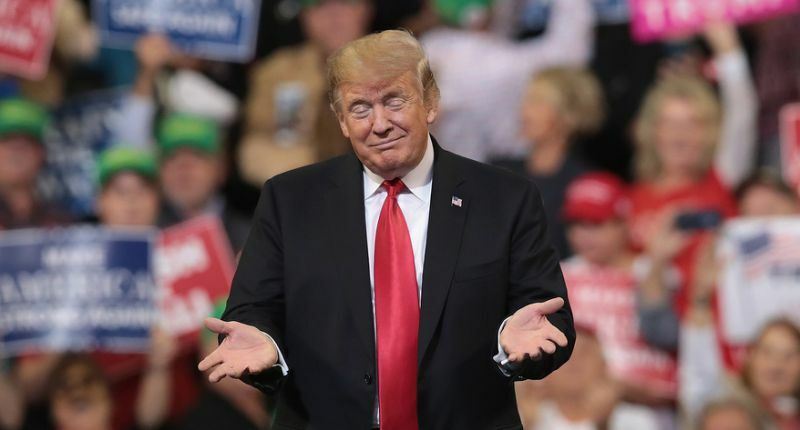 At a Tuesday rally in Council Bluffs, Iowa, President Trump took aim at Sen. Dianne Feinstein, D-Calif., for her handling of a letter sent by Christine Blasey Ford that accused Supreme Court justice Brett Kavanaugh of sexual assault more than three decades ago. At the hearing, several Republicans accused her of just that, but Feinstein was resolute in her denials. In a speech last weekend announcing that she would support Kavanaugh’s nomination, Sen. Susan Collins, R-Maine, said she was certain that Feinstein was not the leaker. “She is a person of integrity and I stand by her,” Collins said. Trump’s ire moved on quickly enough from Feinstein on Tuesday, and minutes later he recounted Clinton’s criticism of his remarks at Kavanaugh’s ceremonial swearing-in. “Lock her up!” the crowd chanted at the mention of Clinton’s name.